Idioms often find themselves embedded into many aspects of our lives. These phrases are used to drive home a thought or differing point of view. We’ve all heard someone tell us “not to cry over spilt milk” or to “not put the cart before the horse.” If you were having a conversation with someone and had not heard a phrase like this before, you could easily get lost in translation. Similarly, this can occur when you’re looking for a solution plan that fits your business’s needs. The phrases “best of breed” and “monolithic” get thrown around so often it might be hard to nail down exactly what they mean and how they can work for your company. Let’s further define the two phrases here. 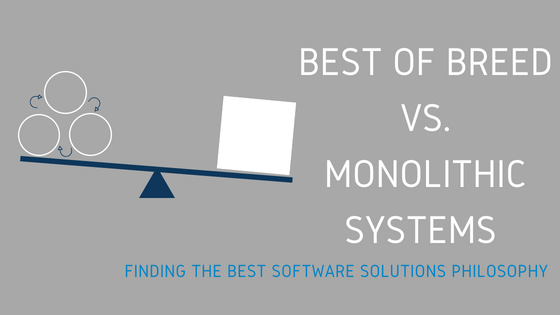 A monolithic solution is the idea that there is one suite of software that addresses all areas of the business under a single umbrella. The entire organization would utilize different components of the suite created for their area of the business. Best of Breed refers to selecting the best available product for each area of the business that openly shares and integrates data to assist your business needs. This approach focuses on utilizing the leading products available in the market from a features and functionality perspective with an open data platform to drive your company’s business. The telecom industry is both complex and competitive, requiring significant technical detail in some areas and subtle artistic nuances in others. At Mapcom, we understand that the decision makers need access to companywide unrestricted data to run the most efficient and profitable business. And we know that your most valuable asset, your people, desire the best systems available to do their job well and execute on the master plan. For these reasons, Mapcom takes the Best of Breed approach with our M4 Solutions Suite. We believe the data is yours, not ours. Our goal is to provide the most comprehensive software solution focused on specific business needs, while openly integrating with other leading targeted solutions to provide the most robust systems engine to operate your business. And as your business grows and technology changes, your company is not locked into one vision, but rather a world of opportunity. And again, we apply no restrictions on how you want to leverage your data. While the decision to choose one solution over the other resides solely in what is best for a company, the age-old idiom “don’t put all of your eggs in one basket” seems to ring true in the Telecom space. By committing to one vendor and their roadmap (not yours) and their stance on locked down data (not yours), companies may fell hamstrung when trying to solve new problems or move into new opportunities. After consideration, the more flexible approach with a wider choice of specialized systems may be the most appealing option in the long run. If you would like to learn more about how Mapcom can help fit into your solution, please visit us here to learn more about our ability to deliver best on what we do while integrating with systems you already own or desire.